I combined a Mark Twain cigar box label graphic and lettering with the mirror image of a post card of the steamboat Helen Blair. I was happy the way it came out. Nice strong silhouette on the boat with its peaky roofed pilot house and those funky clouds the post card artist dreamed up. It has a sort of surrealistic quality to it in a way. Viva Zam Klemenz! Here are the elements showing Beckwith's 1890 portrait of Sam Clemens and Rockwell's 1921 Literary Digest cover that I composited to make Sam a fisher-man. Artist Carroll Beckwith was born in Hannibal, Missouri on September 23, 1852, while still a little boy his family moved to Chicago where at age 16 he would begin to study art at the Chicago Academy of Design. 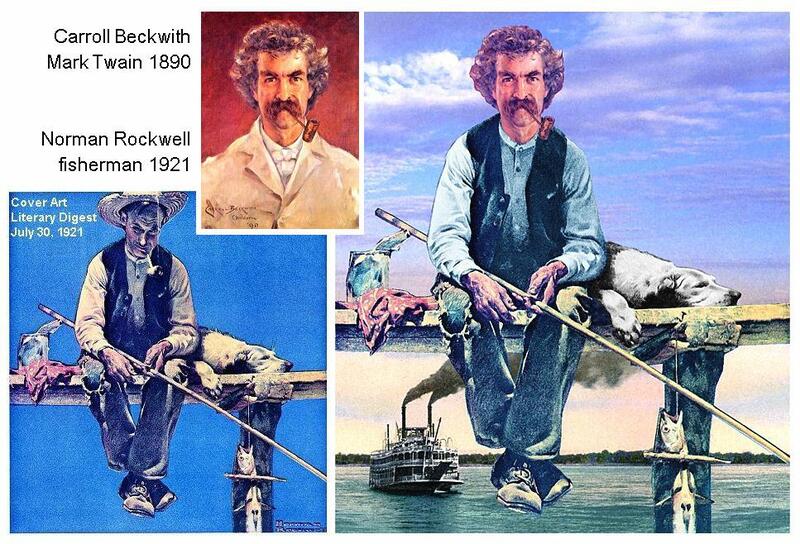 Beckwith became an accomplished portrait painter and in 1890 he painted a portrait of another Hannibal "hometown boy" - Sam Clemens, (Mark Twain) who was born nearby in Florida, Missouri in 1835 and moved with his family to Hannibal in 1839 where he would grow up and have the experiences which led him to write TOM SAWYER and HUCKLEBERRY FINN among other works of fiction. 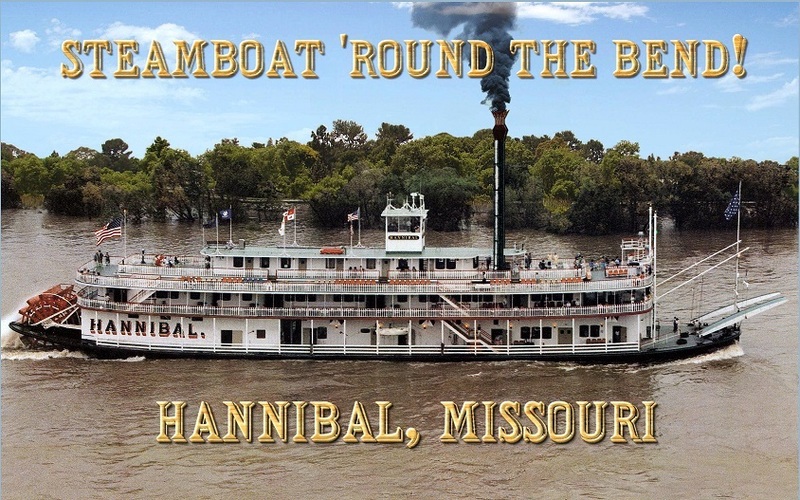 Sam left Hannibal in 1853 as a journeyman printer before becoming a "cub pilot" under Horace Bixby on a Mississippi River steamboat in 1857. In this composite I used an early Norman Rockwell magazine cover of a fisherman sitting on a dock and incorporated a photographic sky (above) and a colorized postcard of the steamboat J.S. on the Upper Mississippi (below). The pieces fit together nicely with the face of a corn cob smoking Sam Clemens painted by Beckwith. 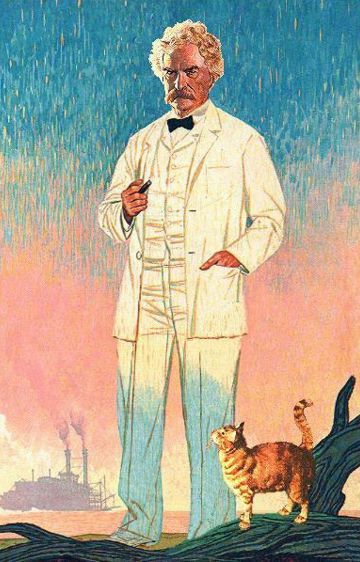 The original painting is in the collection of the Mark Twain House in Hartford, Connecticut. I made this comp about a dozen years ago. It can go with the other Mark Twain "put-togethers" in my wing of the museum if it isn't there already. Wasn't sure where to look for it so I may have missed it. Dave says: "These are some of my more whimsical contributions, some of them bordering on surrealism." Steamboat 'Round the Bend Dave Thomson provided the still photos to entertain the crowds after the third annual online steamboat race. The Knight, Death and the Devil A piece by Dave Thomson when he was at Chouinard Art Institute, Los Angeles, 1964 - 1968. 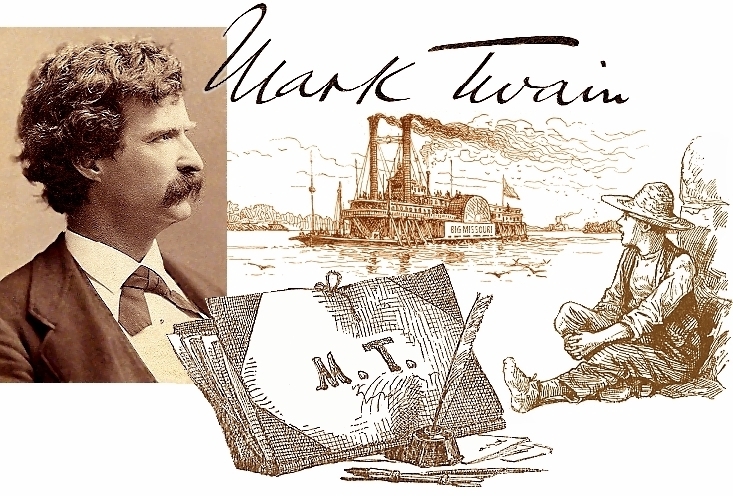 Attached a mock up of a "make-believe" book cover I made years ago as a T-shirt design for Debbie Harris in Hannibal, MO who printed my Hannibal/Mark Twain/Tom & Huck graphics on shirts and tote bags. 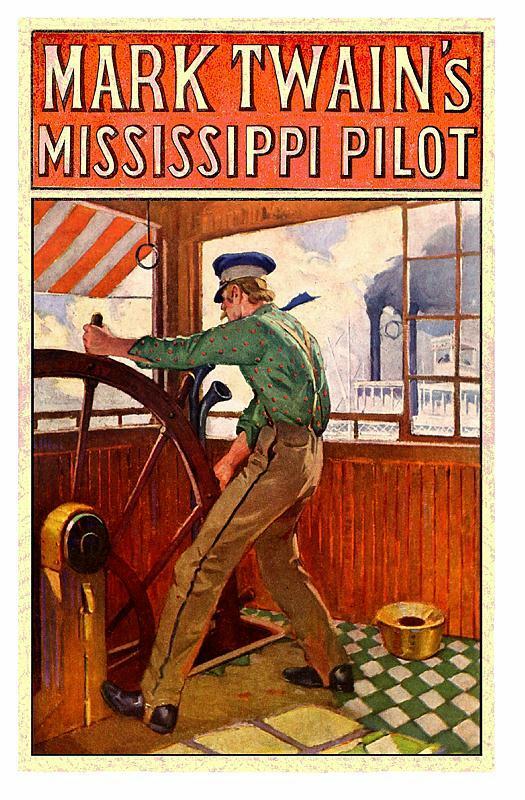 I incorporated on the top, lettering from the front cover of a very old British edition of Mark Twain's OLD TIMES ON THE MISSISSIPPI that had been renamed "MISSISSIPPI PILOT" and used Sidney Riesenberg's illustrations from the book PIONEERS ALL! 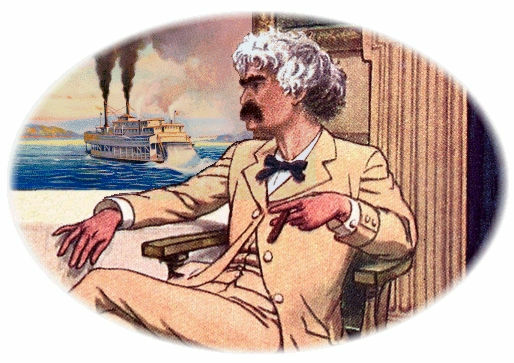 of young Mark Twain as a steamboat pilot that we have on ILLUSTRATIONS 10. All together nineteen American "pioneers" were given the juvenile biography treatment including Mark Twain, Lewis and Clark, Kit Carson, Daniel Boone, John C. Fremont, Charles Lindbergh, and others. 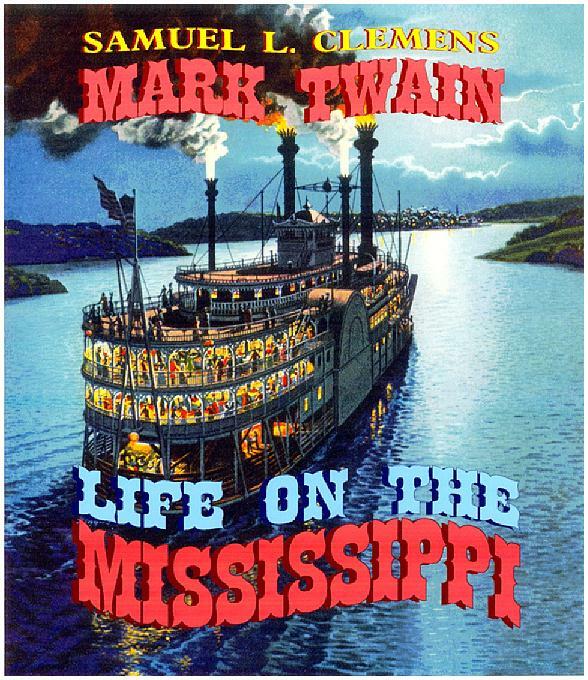 Years ago I had a Corel program that was capable of curving a line of lettering so I made this attached mock-up of a cover for Mark Twain's LIFE ON THE MISSISSIPPI using the illustration from an old Southern Comfort magazine ad for the background. The old display font was perfect and the colors nicely compatible with the moonlit river scene. 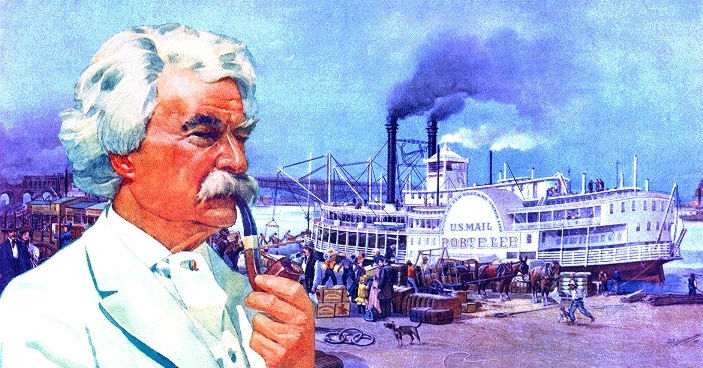 This is a composite I made using a portrait of Mark Twain from an old Campbell's soup ad with the Budweiser promotional painting. The styles of the two artists are pretty compatible together. Comp I made with Twain from an old advertisement by an artist named Brissaud for Old Crow or one of those boozes and put some calendar art of the initialed only "A.C." of the GC Greene in the background. The styles of the two pieces of art was quite different but it's good enough for government work . . . I made the attached a long time ago and Barbara Schmidt has it on twainquotes. It's a combination of a photo of the AMERICAN QUEEN's stacks and 3 chime whistle by Jon Kral from his photography book LIVE STEAM, 2000. 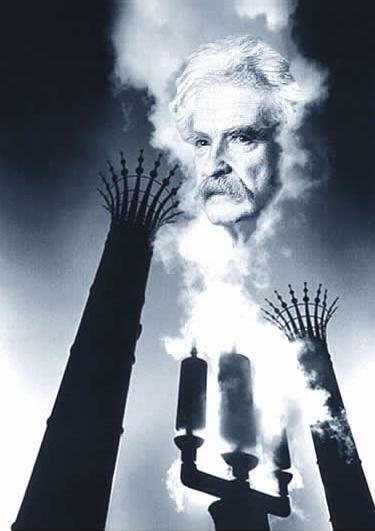 The photo of Sam Clemens' face worked nicely manifested within the billowing steam. - A portfolio, pen, inkwell etc. from Mark Twain's SKETCHES NEW & OLD by Mark Twain 1876. In that same year Williams illustrated the 1st edition of TOM SAWYER. 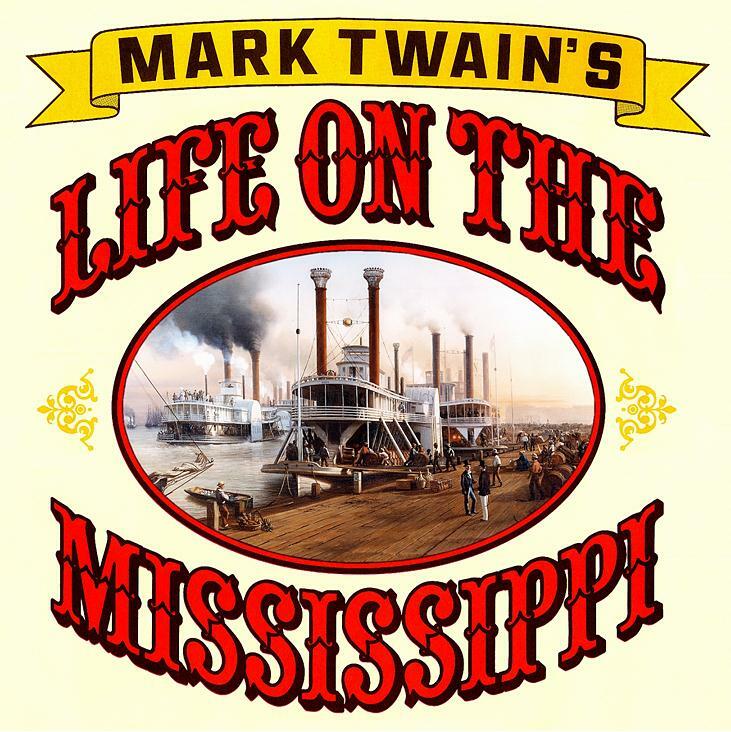 The seated boy watching the river came from the 1st edition of Twain's LIFE ON THE MISSISSIPPI, 1883. 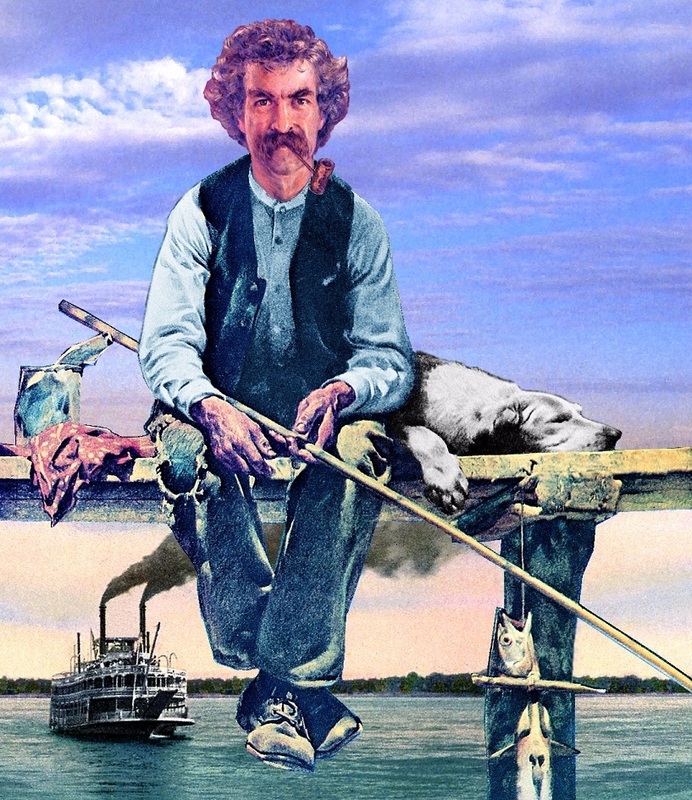 Took a graphic of Twain which had a not particularly good face and standing beside him was a red setter dog. I got a face from another source, touched out the dog and borrowed a cat from Norman Rockwell. Now we're cookin' . . . This Murphy photo of the CITY OF MOBILE taken at the Mobile wharf looks like a scene from a movie. I "posterized" it a bit and graduated the color from blue above to sepia below. 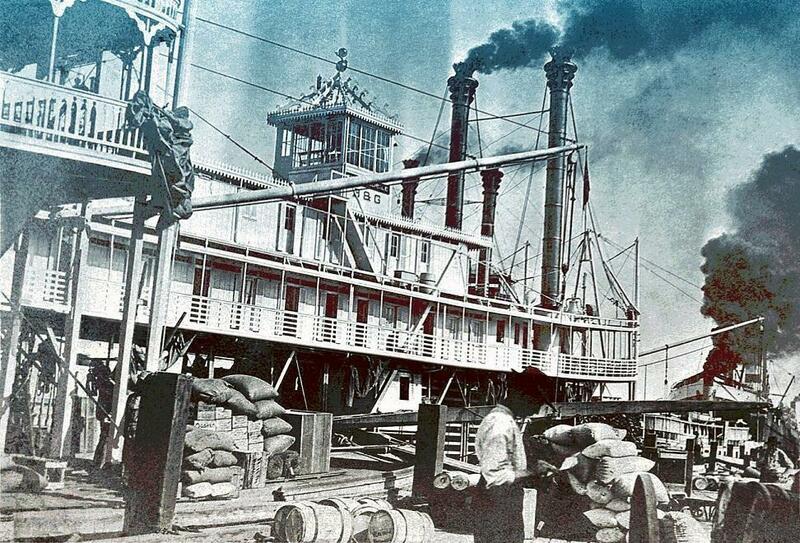 This is a Photoshop composite I made with a photo of the NATCHEZ whose name I changed to HANNIBAL (after the boyhood home of Sam Clemens in Missouri) and the cityscape of New Orleans behind the boat I transformed into a verdant riverbank from a photo that I took of the eastern shoreline of 17 acre Bixby Slough (now referred to as Bixby Marshland and on the map called Machado Lake) at Ken Malloy Harbor Regional Park in the city of Carson, at the northeast corner of Vermont Avenue and Anaheim Street east of Los Angeles Harbor. The "Slough" was my substitute for the Mississippi River when I was attending high school in nearby Palos Verdes on the Pacific Ocean. 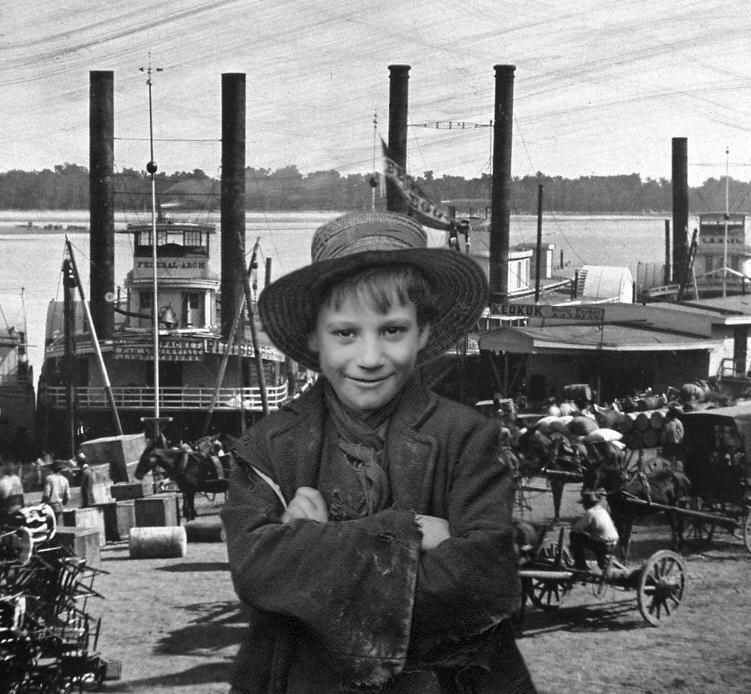 Had been visualizing making the attached incarnation of Huckleberry Finn for quite a while and finally came up with harmonious elements that combined made a reasonable facsimile of a ragamuffin on a Mississippi rivertown steamboat landing wearing a worn out coat, vest and neckerchief. The boy's expression conveys a sense of self confidence and mischief that transcends his modest circumstances. My friend Jim Waddell in Hannibal portrays Mark Twain at the Museum and the Cave and he produced a radio play edited from a 1940s radio scenario adapted by Orson Welles from Twain's HUCKLEBERRY FINN. A reading of this scenario is performed in front of live audiences in Hannibal by local actors and Jim had proposed using my composite of the urchin Huck for posters and other advertising of the presentation called simply HUCK. I don't know if they ended up using this or not but it was fun to create anyway. Below that is the text of Twain's description of the "urchin" Huck Finn in Chapter 5 of the novel TOM SAWYER. I gave my Huck the outsized and shabby adult's coat but left his hat intact without the crescent lopped out of the brim. Built in 1850 at Brownsville, Pennsylvania. Ran between St. Louis, MO and Pittsburgh, PA.When the Mississippi River froze up at St. Louis on 28th of February 1856 was crushed by ice. Built New Albany, Indiana in 1852 for the St. Louis-Keokuk trade. Ran the Illinois River in 1853, first to arrive in Peoria. Was snagged and sank at Island 25 below Cairo, Illinois on 3 of March 1854. Four screen captures from the DVD of the 3D IMAX motion picture MARK TWAIN's AMERICA which was filmed in many locations in the U.S.A. where Sam Clemens (Mark Twain) lived or visited and which celebrate his memory today. 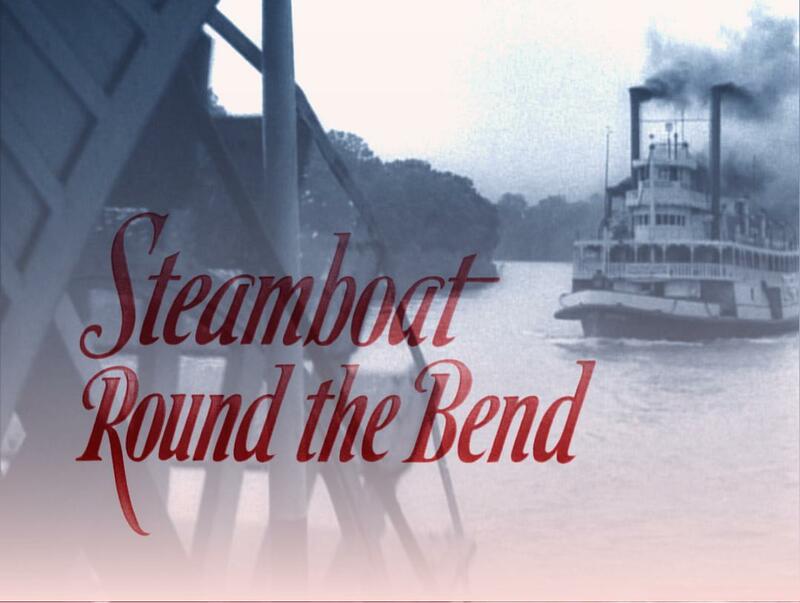 Captain Dennis Trone steered his beloved JULIA BELLE SWAIN past the camera and in 3D on a huge IMAX screen the steamboat looked as big as life. Dennis is visible in the pilot house in the lower right frame, framed between the stacks at dusk. The DVD, released in 2005 and available from amazon.com is not in 3D but worth viewing for scenes of the JULIA BELLE; Hannibal, MO; Virginia City, Nevada & Hartford, Connecticut among other places. 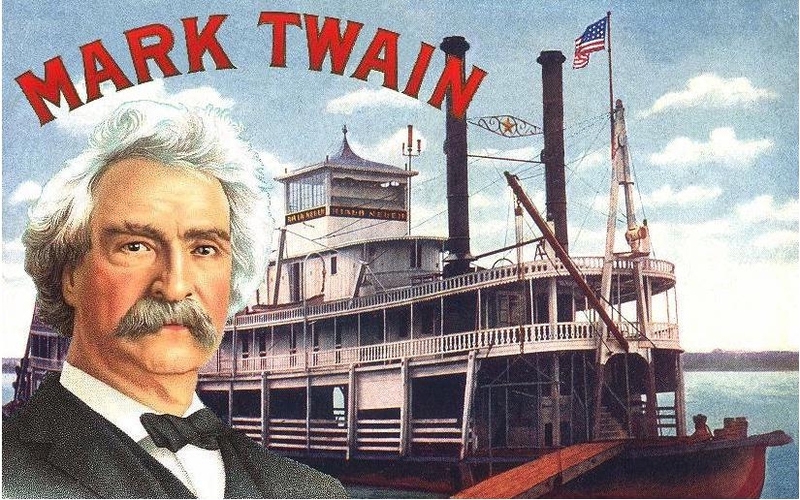 A promotional poster for the PBS LIFE ON THE MISSISSIPPI TV movie in 1980 was issued with photographs of locations in Hannibal, Missouri that were associated with Sam Clemens. I reformatted the lettering and replaced their photo of the JULIA BELLE SWAIN inside the oval frame with a detail from Hippolyte Sebron's 1850 painting of steamboats at New Orleans. "Jim describes technical stuff clearly and concisely so that a non-engineer can grasp it, which is quite a gift. He knew quite a few old time rivermen in the South and has letters and interviews with them that are full of fascinating details of that vanished era. Jim kept track of all the descriptions they gave him including color schemes (very handy for model making) and the particular idiosyncrasies each boat had." 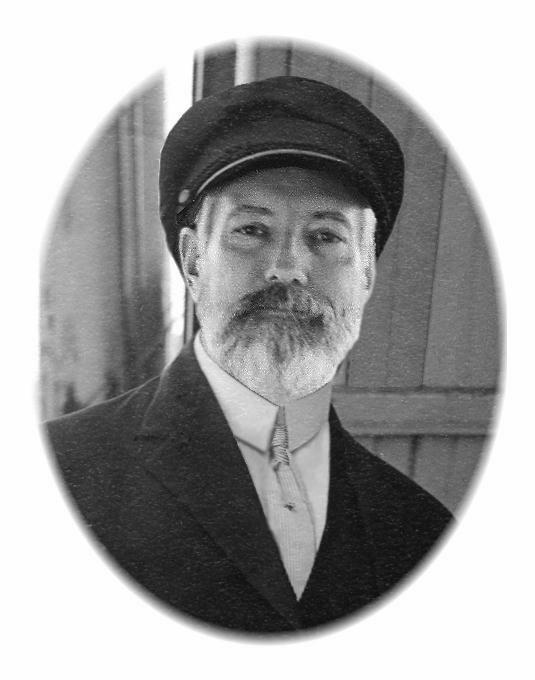 Dave made this image by incorporating Jim Hale's face into an actual old photo of a steamboat officer. Click here to see the Jim Hale Model Boat exhibit at this site. 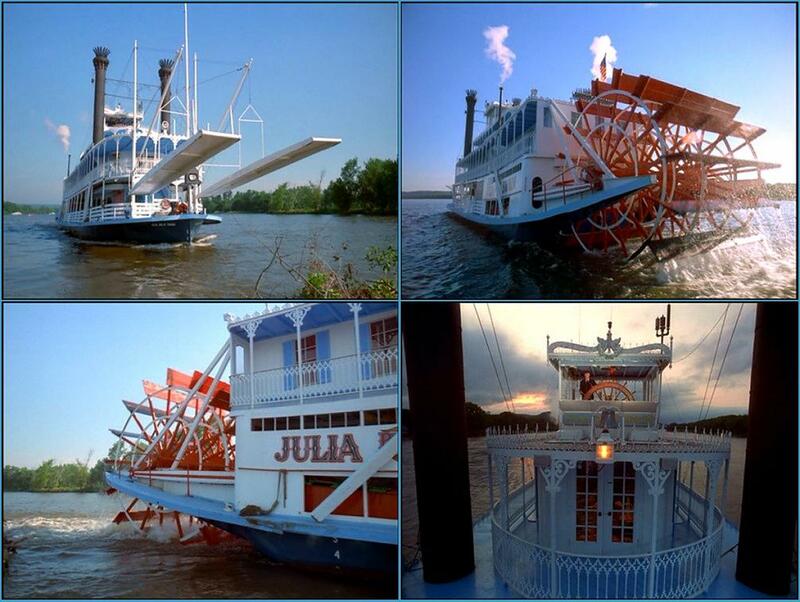 Click here to see the new Steamboats.com model building page at this site.